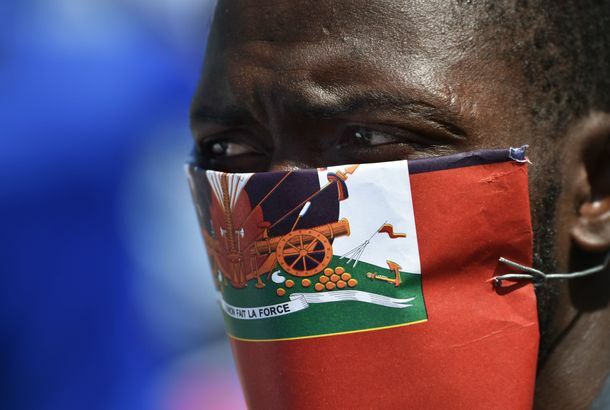 Trump Administration Revokes Protection From Deportation for 60,000 HaitiansOfficials say they’ve determined Haiti is safe enough for them to return, though conditions there are still dire. This Designer Is Making School Uniforms for Underprivileged Students in HaitiUsing her fashion credibility for good. Former Pop Star Sworn In As President of HaitiHe live-tweeted it. Cholera Outbreak in Haiti Started With the U.N. PeacekeepersIt’s a “perfect match” for a strain from Nepal. See Three Videos From Arcade Fire’s Surprise Haiti PerformanceCyndi Lauper! Now Aristide Wants Back Into HaitiHere we go. The Ten Most Expensive Gifts President Obama Was Given in 2009Saudi Arabia was No. 1. Silvio Berlusconi wasn’t bad, either. No. 10 will surprise you. Baby Doc Duvalier Led Away From Hotel by PoliceIt’s unclear whether the former Haitian dictator has actually been arrested. Exiled Dictator Jean-Claude ‘Baby Doc’ Duvalier Returns to HaitiJust what Haiti needs right now. Great News: Wyclef and Pras Are Buddies Again“On my way 2 Haiti ran into Praz, what should I do make peace or go sit somewhere Else! I Made peace 4 Haiti! American Relief Worker Freed From Haitian JailPaul Waggoner saves children. He does not kidnap them. Wyclef Fires Back in War of Words With Penn and PrasPenn’s rep immediately responds to cocaine accusation. Wyclef Jean Out As Haitian Presidential CandidateThe hip-hop star has been disqualified. Wyclef’s Presidential Dreams Are OverNot approved to run in Haiti’s election. The Rachel Zoe Recap: Rachel and Brad Confront Real TragedyLike the Haiti earthquake and Alexander McQueen’s death. It was most uncomfortable to watch. Pras Still Not Voting For WyclefLike his being unqualified. Pras Won’t Be Voting for WyclefHe’s endorsing a different musician! What L.A. Weekly Reveals about Tom Leykis, Dead Bodies Found at Safeway,The new People Issue offers new insights into our restaurant owners and chefs. Fashion’s Night Out to Launch Clothes; See Erin Wasson’s ClosetAlso, Dr. Martens makes wingtips now. Olay Signed Thandie Newton; the Bumpit Failed SnookiAnd Amanda Seyfried knows her tattoo is naughty. George W. Bush and the Case of the Black HandsDoes Bush have a problem shaking the hands of black people? Obama Divvies Nobel Winnings Among Charities, Former PresidentsNot to mention a little deposit for the curiously named Posse Foundation. Boulud Loves Babies; Ubuntu Chef Says He’s Just Vacationing in L.A.London chefs disagree with a French chef over infants in restaurants and Jeremy Fox denies L.A. restaurant plans. Judge Releases Eight Americans Jailed in HaitiThe child-kidnapping case has dragged on for nineteen days since a January 29 arrest. Jay-Z Questions Choice To Remake ‘World’“Some things are just untouchable,” the rapper says. ‘We Are the World’ Reboot Video Is HereYep, there’s Auto-Tune. Lady Gaga’s Skeleton Corset Looks a Little Gross When She’s Not Wearing ItAlso, it comes with a plastic glitter diaper hanging off the bottom.